Lillebaby Eternal Love Ring Sling is an easy and elegant way to nurture the bond between you. This natural, 100% premium quality linen ring sling is lightweight and breathable, easy to use and designed with elegantly adorned rings as a reminder of the incredible gift of love you are carrying. Like all LÍLLÉbaby designs, the Eternal Love Ring Sling combines new innovative functionality with timeless style. The unique, removable zippered pouch carries your essentials and provides a layer of padding beneath the rings. It’s a beautiful way to keep your little one close to your heart. Ring slings are lightweight, and can easily be folded up to fit into a bag or a pocket. They are prized for their ease of use – ring slings are easy to put on and the wearer can easily change baby's position. 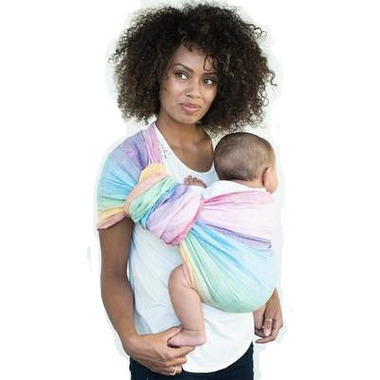 The adjustable length of the fabric allows parents of all sizes to use and share the ring sling. LÍLLÉbaby Eternal Love Ring Slings are crafted with a single layer of 100% premium linen, paired with engraved gold and silver rings, and include a storage pocket with a protective pad. The pocket-size foldable instruction card fits in the front pocket of the pouch for easy reference on the road. The Ring Sling is ideal for babies minimum 7 lbs (3.2 kg) to 35 lbs (15.8 kg). The slings are made with beautiful joint-less metallic rings designed especially for ring slings, with premium zinc alloy - a material frequently found in premium jewelry - free of harmful material and nickel free. The rings were chosen for their exceptional strength and high quality, and crafted without any weld or join. They are carefully safety tested for strength and harmful substances, and are CPSIA compliant. The rings are like jewelry: beautifully adorned with an eternal-love symbol to remind you of your eternal bond. 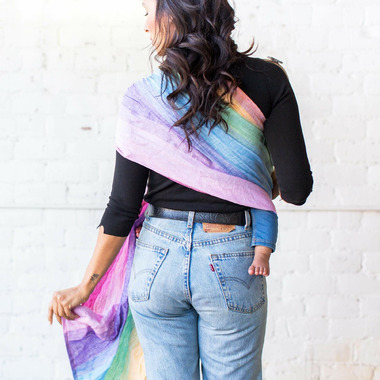 Crafted of fine, all-natural fibers, the Ring Sling is 100% linen. The fabric has a beautiful natural texture and drape. For everyday cleaning, it is suggested to spot clean the fabric: gently pat the fabric with a damp washcloth to get smaller stain off. If deeper cleaning is needed, LÍLLÉbaby recommends handwashing part or all of the sling in room temperature water. Due to the nature of linen, the fabric will wrinkle, so to save some ironing work many choose to clean smaller areas of the fabric. The Ring Sling is machine washable. Unthread your sling and remove the pouch. Ideally, place the ring sling in a laundry bag. Machine-wash on cold, gentle cycle using mild detergent. Hang or lay flat to dry. Steam iron to remove wrinkles.